As a leading lifestyle brand focused on making yoga and fitness accessible for everyone, Gaiam currently has a worldwide network of approximately 38,000 retail environments with 18,000 of those located within existing retail locations. So when Macy’s began a new initiative to transform a retail location into the “Store of the Future,” they approached Gaiam with an opportunity to create a completely new retail environment meant to achieve a higher level of customer engagement. Understanding exactly how they wanted to capture the attention of Macy’s shoppers, Gaiam began working with Reflect, which chose to incorporate FLEXLite NXG 3.9mm LED video technology from Nashville-based PixelFLEX into the exciting, new retail environment. 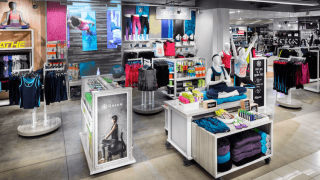 Beginning the design process of their innovative retail environment, Gaiam was introduced to Dallas-based Reflect, which has been working with Macy’s for a number of years as its in-store digital media partner. The FLEXLite NXG is now available in two sizes with 2.6mm-6.25mm pitch options for an even deeper layer of creativity, plus a 6.25mm full outdoor, IP65 version as well. For performance, FLEXLite NXG tiles are calibrated directly out of the box to ensure perfect color and brightness; and with serviceability in mind, easy access to the back of panels allows for quick and simple on-site repairs. Now that the LED video technology solution was in place, the design team got to work installing the FLEXLite NXG into the Gaiam retail environment. As retail environments continue to evolve in order to compete with the growing trend of online shopping, retailers are constantly looking at which technologies will draw consumers into their store front locations. With the introduction of new technologies, not only are they able to create these unique environments, but they are also now able to conveniently update their branding content throughout all their locations.